An exclusive replica of Nick Fury's iconic briefcase used in the Avengers box set may cost Marvel a bundle. 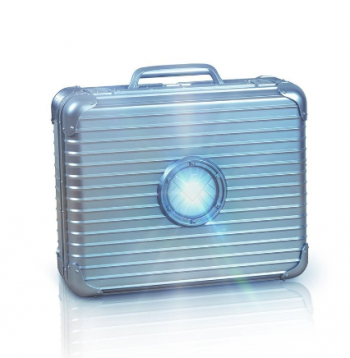 If you went to see The Avengers, one image is undoubtedly seared into your brain: Nick Fury's snazzy attachÃ© case. That thing just stole every scene it was in, and it became so iconic that Marvel decided to use replicas as packaging for their limited edition boxed set collection. This is proving problematic, as the German designers - Rimowa, makers of the Topas briefcase - are asking for statutory, compensatory and punitive damages as part of their trademark infringement suit against Marvel. "Images of the replica briefcase on Marvel's advertising materials," says Rimowa's complaint, "and fan video from Marvel's product display at this year's ComicCon convention, show the plastic 'replica case' to be a close copy of Rimowa's Topas attachÃ© case in every respect but quality." Rimowa was fine with the case appearing in the movie - in fact, they supplied it - but nobody told them Marvel was going to use a knock-off of their case design as schlock packaging for a movie boxed set. Rimowa is miffed, and seeks vengeance. Specifically, it wants a prohibition against further infringements, all profits from the alleged unlawful conduct, and an award of three times its actual proven damages. Its demands may just be pre-trial chest-thumping; when this issue has come up before - as with The Hangover 2 and its alleged Louis Vuitton handbag, which provoked a suit against Warner Brothers - the courts have been less than sympathetic to designers claiming trademark infringement. No doubt Rimowa is fully aware of this, and would like a settlement if they can get it. However there is a significant difference between the situation in The Hangover 2 and The Avengers. In The Hangover 2 the handbag in the movie was fake and everyone, including Vuitton, accepted that it was a fake. In The Avengers the Topas was the real deal, and Marvel would have known that when it put its boxed set together. "Marvel did not obtain any license or authorization from Rimowa to make replica copies of the cases for any purpose," Rimowa helpfully points out. Here's hoping Marvel's lawyers have a convincing counter, or at least a handy shield to hide behind.